Time for the annual hike down memory lane for 2014, wrapping up the 10th year of this blog (official anniversary coming up in March). These posts have been chosen with a particular focus on significant ideas I'd like to see kept alive for discussion and action, and they're mainly targeted at new readers who want to get caught up with a quick overview of the Houston Strategies landscape. I also like to track what I think of as "reference posts" that sum up a particular topic or argument; and, last but not least, they've also been invaluable for me to track down some of my best thinking for meetings or when requested by others (as is the ever-helpful Google search). Don't forget we offer an email option for the roughly once/week posts - see the Google Groups subscription signup box in the right sidebar. An RSS feed link is also available in the right sidebar. And don't forget the highlights from the first few years. For what it's worth, I think the best ideas are found there, often in the first year (I had a lot "stored up" before I started blogging) and most definitely in the 5th birthday retrospective and the best of the first 1,000. My own snapshot of the old grey lady on a rainy day as I left the ULI event. 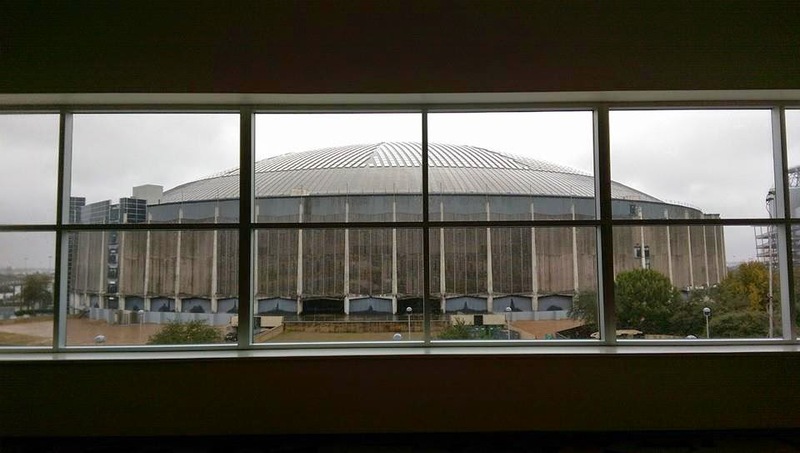 Longtime readers know I've talked a lot about the Astrodome over the years, with my own thoughts on the indoor park idea here. Yesterday I was able to attend a 10-member ULI panel presentation at NRG/Reliant Park on their proposal for what to do with the Astrodome. This panel consisted entirely of experts from outside of Houston (so no conflicts of interest), and they were surprisingly enthusiastic in their recommendation to save and re-purpose the dome. This was not a presentation of, "well, if the all the stars line up you might be able to make this work." The theme was more, "this is an absolutely incredible opportunity and you would be fools to not seize it." In fact, Tom Murphy, former mayor of Pittsburgh, was the anchor speaker and threw down the gauntlet, challenging us to step up to the plate, think big, and make this happen (you can see some of his speech in this KHOU Ch11 video). He said they see way too many cities with "it'll-do disease" where they're not willing to think big, but just do enough to get by at the lowest possible cost, and it would be a tragedy if Houston went down that path here (it certainly would be a break from our big thinking past, from the ship channel to the Astrodome to NASA). His recommendation: lock all of the relevant players (including the Texans and Rodeo) in a room with a strong local leader and don't let them out until they come to a consensus on the plan! Brilliant putting 1,500 to 2,000 parking spaces in two levels at the bottom of the dome's bowl, which makes it a lot easier to sell to the Texans and Rodeo. In general, they said they bent over backwards trying to accommodate their needs, as well as the OTC. They smartly called for refreshing the different tenet agreements at NRG Park, rather than just trying to stay within their limits that never envisioned re-purposing the dome. They very explicitly did not recommend a replacement for the NRG/Reliant Arena, whose functionality they believe can be included inside the revamped Astrodome. Boom - $150 million saved right there! That may give the Rodeo a little heartburn, but - as I've said before - it's the right call. They believe it might be possible for operating costs to be covered by revenues, so it won't be an ongoing burden. The capital costs are the trickier part, although they laid out a lot of options there. Overall it was far better than I had hoped or expected. I'm looking forward to their complete report in 2-3 months, but hope the Judge Emmett and the County don't wait that long to get the ball rolling - we've only got two years until the Super Bowl and the eyes of the world are upon us. If Brown and Root could build Rice Stadium in one year in 1950, then we should be able to do amazing things with the Astrodome in two - we just have to think big and get cracking! Update: A video of the complete ULI panel presentation has now been posted online here. Last month I attended the iNACOL Blended and Online Learning Symposium in Palm Springs, California to learn more about where education is headed (I blogged about my 2012 experience here). The theme was "Powering Personalized Learning," and there is some incredible stuff going on, from adaptive eLearning programs to making customized educational games. It reminded me of a great quote by author William Gibson, "The future is already here - it's just not evenly distributed," by which he means that there are already pioneers doing now what we'll all be doing in the future, they just haven't spread to the mainstream yet. You just have to know where to look. There are definitely some schools doing amazing things, they just haven't spread yet. In my opinion, the two most interesting ones are, on the private school side, Acton Academy in Austin, and on the public school side, Summit Public Schools in California. Summit had a higher profile at the conference, but Acton was highlighted in speeches by two different keynote speakers, including Vicki Phillips from the Gates Foundation and Sal Khan of Khan Academy fame. Their models are very similar, with lots of student agency and teachers who've switched from lecturing to mentoring and guiding. The students work at their own pace through playlists of eLearning curriculum - earning learning badges - as well as working on collaborative projects where they learn 21st-century teamwork and leadership skills (plus outside workplace experiences like apprenticeships). This approach is *far* more engaging for the kids, and therefore they learn so much more and faster. Acton's kids are testing 5+ years ahead of grade level (! ), and Summit is one of the top performing public schools in California (let's hope their charter school model comes to Texas). Laura Sandefer, a founder of Acton Academy along with her husband, was just in Houston last week to talk about the school on KHOU Channel 11, which you can watch here. Needless to say, these models seem far too radical for traditional public schools to embrace, so they've been engaging in more modest blended learning experiments, with mixed success - mainly, IMHO, because they are too locked into the rigid, sequential, single classroom/teacher/subject model, both in their mindset and their physical buildings. Michael Horn, co-author with the famous Harvard Business School professor Clayton Christensen of the book "Disrupting Class: How Disruptive Innovation Will Change the Way the World Learns " a few years ago and definitely one of the leading thinkers on education, released his new book, "Blended: Using Disruptive Innovation to Improve Schools " as a handbook sequel to Disrupting Class with a step-by-step process traditional schools can follow to embrace blended eLearning. I bought a copy, got him to sign it, and read it on the flight home - very highly recommended if you are involved in education in any way and it can be used no matter what level you're at, from an individual teacher through school, district, and state-level administration. In his sessions, he also discussed "micro blended learning schools" - one-room schoolhouses updated for the 21st-century like Acton Academy - as a wildcard of potential disruptive innovation in education, which I completely agree with. He notes that they hit two of kids key motivators perfectly: (1) making clear progress and experiencing real success (vs. traditional grading that tells most kids they're not succeeding) and (2) having fun with friends on projects (as opposed to being forced to sit quietly and listen to a lecture). If you'd like to read more about the conference, Getting Smart has some great blog posts on day one, day two, day three, leaders, and technologies. If you're interested in learning more about the Acton Academy model, they were profiled on Getting Smart here and Talent Unbound is their affiliate in Houston. I'd like to open up this week talking about Salon's crazy rant about central Houston gentrification (alternate link) and, essentially, the declaration of the "Peoples' Republic of Upper Kirby" - which is just as absurd as it sounds. Despite being the online equivalent of a homeless man screaming about the end of the world - with about as much credibility - it's getting a lot of buzz in Houston social media. Summarizing, it essentially says "I was a lucky artist that scored some primo cheap housing near Kirby, and now I'm pissed off because the city continued to grow and evolve and I'm getting kicked out for new development." Obviously, the solution is that Houston should have frozen all inner loop development and residents around 2000 (or maybe 1990? or maybe 1980? when did it peak again, Mr. Author?). The rant is essentially NIMBYism in its purest form - "I moved someplace I loved and I don't want it to ever change in any way, including the people." At one point, he even claims there is "no affordable housing within the city" which he seems to define as within 2 miles of inner loop Kirby - ignoring the other 500+ square miles of very affordable Houston (see map here). The whole piece is so off the rails that even the lefty Houston Press weighed in against it. I suspect the whole thing might be a trolling prank. "Urbanists need to face the full implications of peak car" As vehicle-miles continue to fall, Aaron Renn at Urbanophile questions continued arguments of "induced demand" against road expansions, since with current trends it might actually be possible to build our way out of congestion after all. Hallelujah - let's hope so. Evaluating Urban Rail: Wendell Cox at New Geography shows that, despite billions being spent on urban rail in this country over the last few decades, transit's trip share has mostly stagnated or declined. "Choose One, Millennials: Upward Mobility or Affordable Housing - The paradox of the American Dream: The best cities to get ahead are often the most expensive places to live, and the most affordable places to live can be the worst cities to get ahead." Houston seems to do pretty well on both if I'm interpreting the graphs correctly, although our affordability has certainly dropped during the last few boom years. I general, I think the author might be sort of ignoring Texas because it doesn't fit their thesis - we have upward mobility with affordability. Hat tip to Neil.